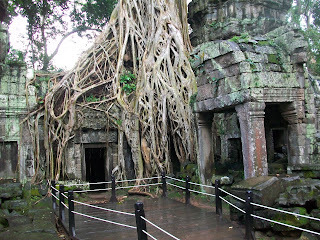 Of the many amazing temples I saw in Siem Reap, Ta Prohm is definitely my favorite. It seems on the verge of collapse under the weight of the roots of towering trees. The scent of decay is pronounced and more so after a tropical downpour. While seeking refuge inside one of the temple structures, we were enveloped by an oppressive and dank air which no amount of incense could erode. But this is to be expected of an enclosed space that is being choked by its surroundings. There's so much drama in this jungle which is why I like it the most. Piles of stones are everywhere. Moss and lichen cover the walls and roots the size of an elephant wrap over and around the structures. Built in 1186 as a Buddhist temple dedicated to the mother of Jayavarman VII (the greatest ruler/builder of the Khmer empire), it was abandoned until the 16th century when Portuguese explorers visited the Angkor complex.